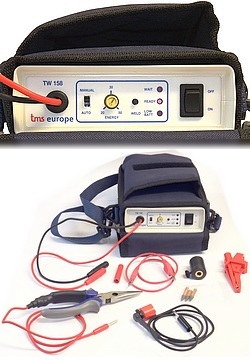 Designed to be small and easily carried by engineers this AA battery powered welder is ideal for occasional on-site welding of fine wire thermocouple junctions for thermal surveys of autoclaves, ovens, furnaces and heating and ventilation systems. Manual and Auto (Hands Off) operation. Variable energy level from 20 to 50 Joules. Runs on AA batteries (over 400 welds at 30 Joules). Auto switch-off after 3 minutes to conserve battery. Output voltage is only 60 Volts at 50 Joules. Lightweight padded carry case, includes shoulder strap, belt loop and tool storage.